Curved seat walls with cushions provide seating on either side of this fireplace. DC West Construction in Carlsbad, CA. 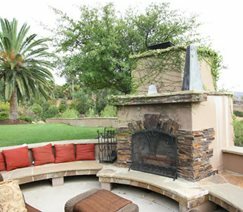 Patio furniture is a good option for a fireplace because it can be moved around. Some guests may want to be closer to the heat than others and portable furniture will allow them to sit at a comfortable distance. The best patio furniture for enjoying an outdoor fireplace is a conversation set. A conversation set usually consists of deep seating chairs and a love seat as well as a coffee table. Select furniture that invites relaxing—look for chairs that are low to the ground, have big comfy cushions and lean back. Bare metal patio furniture may not be the best option next to a fireplace because it conducts heat and may become uncomfortably hot. 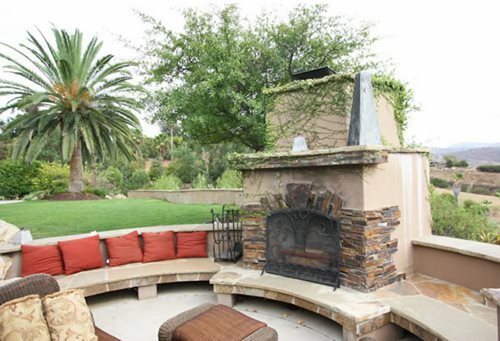 A second backyard fireplace seating option is to have built-in seating installed. Outdoor built-in seating is often referred to as seat walls. Seat walls can be made of poured concrete, stone or brick. Often built-in seat walls are designed as an extension of the fireplace's hearth. Seat walls can be bench style or have a back. Average seat height is between 18 and 20 inches. You'll need 24 inches of width for each person you would like to accommodate along the seat wall. Consider adding pillows or custom seat cushions to increase the comfort of built-in seating. If you are ordering a prefab fireplace, check with the manufacturer to see if they offer a matching seat wall option.